This is another wheel of fortune sharing the name roulette. It is also called the Big 6 and is played by spinning a large wheel in vertical position. The history of this game can be traced back to the late 1800s in the US and the traditional carnival prize wheel. The carnival became a big attraction leading to the adoption and installation of giant wheels offering fantastic prizes at many amusement parks including Coney Island Fair and the Boardwalk in Atlantic City. Casinos adopted the Big Six Wheel model on seeing its popularity and mode some modification to reduce the size and simplify it for casino use. This become the famous Big Six Money Wheels found in casinos today. 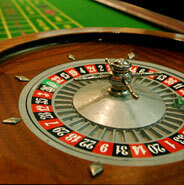 The game is simple and easy to learn which has led to its popularity with new casino gamers. To play this game, you only have to bet on which number the pointer will stop at, spin the wheel and hope for the best. The wheel has been divided into 54 equal sections clearly separated by a pin, peg, wooden spoke or some metal marking each section. There is a rubber or flapper on top of the spinning wheel at the twelve o'clock position which points downwards. It is stationary. Every section of the wheel is marked with a sign. The signs or symbols correspond to numbers on the spinning wheel each in its section. The Big 6 Money Wheel comes with its table which is used for betting. The betting table has symbols drawn on it corresponding to the number and symbols on the spinning wheel. To play you require to place your bet on the table on top of the symbol and number you think will lie below the rubber or flapper pointer at the top of the wheel by the time the wheel comes to a complete stop. When the wheel stops, the symbol below the flapper wins and the players who betted on that symbol wins while those who betted some where else loose. The dealer proceeds to collect all the loosing bets as he pays the winning bets if there are any and that round is over the game can start for those ready to play. The symbol the flapper stops at and the currency determines the payout ratio of the winning prize. Players are free to bet on as many sections or symbols as they wish but it is certain that only one symbol can win in a spin. It may look like a bright idea to spread your bets but a careful consideration would reveal that spreading bets wide would imply that even if there is a win, it may simply not cover the amount of bets hence losses. The game requires no strategy and it is easy to loose your money as it is easy to play. You can learn a lot from the famous roulette players.